Way back last year Jane asked me when I was going to be spicy again. It became a personal theme: 2009, Spicy One More Time. 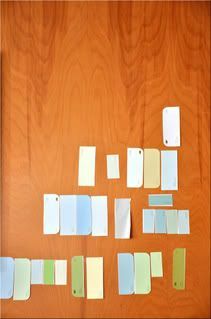 And I wanted to record that The Spice has begun via paint chips in my living room. But before we start that we've got to make the wallpaper disappear and resolve to paint over the birch paneling.